In a recent published article, Dr Anderson et al. (at Wake Forest University School of Medicine & McMaster University) identified seven aspects that patients' complain about. This category received the second largest volume of comments pertaining to excellence in health care. Patients distinguished 4 key areas of communication that defined high quality care, summarized as “personal attention” given by the provider. Patient as partner. Another quality of excellence is when a doctor instills a sense of partnership with the patient by using attentive listening of patient concerns or values to adjust and individualize treatment, and encourages patients to openly discuss their concerns. Giving information. Much information, often technical in nature, is exchanged in a clinical care encounter and providers who do this well in a manner that the patient can understand, are highly praised by their patients as being approachable and easy to talk to. However, the method and delivery of the communication are also admired qualities. These include being soft spoken and direct, getting the providers honest opinion in a warm conversational style. Getting excellent medical care is high valued and consists of a complex of qualities, including patient advocacy, and technical competence such as diagnoses/ treatment approach and options, and thoroughness, amount of time spent with patient, and use of medications. Technical Competence. Of all categories, comments on a doctor’s excellence in competence were the most numerous type of praise offered by patients. This result underscores that patients attend an office visit or chosen a provider for a procedure or facet of health care management, and having a skilled practitioner is crucial. Competence is viewed or defined by patients includes facets of treatment approach and outcomes. Thorough. Patients place high value on receiving careful attention from their physician, and not feeling rushed through their visit. By taking time, patients feel listened to and receive thorough care. Patients visit doctors complaining of a symptom, not a disease. It is all about the differential diagnosis of symptoms and signs. DDx is the main focus of physicians during patients’ interviews, right? OSCE stations, similar to real life patients’ interviews, have limited time. Physicians have no choice but to be focused and to organize the interview in a time efficient manner. The reality is that physicians have no time to listen to their patients. On the other hand, physicians have to be vigilant not to miss anything! Obviously, there is a need for some sort of an approach that will fulfill both patients and physicians goals. An approach that will explore all the patients’ presenting issues in a limited time frame. An approach that will protect both the patients and physicians. The solution is to memorize a set of history taking questions and to do physical list that will fully take off the burden of the differentials and clinical decision making off our minds removing stress and give physicians the time to incorporate communication skills and establish rapport with their patients. How did we at OSCEhome formulated the OSCEhome Systematic Approach ? We started by preparing a list of all signs and symptoms a physician faces. We wrote one sign or symptom on a separate sheet of paper. Then for each symptom or sign we wrote all the possible differentials. Then, we draw a table, assigned a column for each differential and wrote that symptom/sign presentation details, quality, duration, relation to other symptoms/signs, and red flags.. Etc.. Then for every detail, we wrote questions to ask for or points to examine. Obviously, there are now, many identical questions or points to examine concerning this symptom among all these differential diseases. We started to merge the diseases’ columns into one set of questions. When the same question is required for several diseases, we placed these diseases’ names between brackets after the question to help us later with the clinical decision making process. Then we arranged these questions and points to examine in a logical easy flowing flowchart. We have noticed that there are some details that are not required if you are just screening for a symptom and not thoroughly gathering details about it. So, we divided the to ask/do list into two files, we placed the must ask/do important ones up in the list for screening, and the rest at the bottom for detailed data gathering sub-file, and just in case we run out of time. What about communication skills? It a major issue to ensure an easygoing interview professional organized interview and to achieve a mutual understanding and respect. We rephrased the questions to meet communication skills guidelines. e.g. English language issues, open ended questions, non-leading questions, respective manner ..etc. Now, we have all the needed questions to ask and points to examine concerning that symptom on a separate sheet of paper. We placed the sheet in a separate file, labelled it with the symptom/sign name. Then, we repeated the same process for all other signs and symptoms. Again, there are now, many identical questions or points to examine among all these symptom/signs. We started to gather identical questions or points to examine into a separate file box and crossed it out on that symptom/ sign sheet. e.g questions about medications, past illnesses, social, ..etc. Remember, in real practice, as well as during OSCE stations, our time is limited. So, we carefully went into each of these box files and rearranged the questions and points to examine for maximum time efficiency. We came up with a tree of a step by step history taking and physical file boxes. During the patient interview, you go through the file boxes one by one. You only open the box files you need. Let us take an example. A patient presented with cough. Introductions box: 5 sentences to say. Chief Complaint: 10 question to ask. HPI: 15 questions to ask. Respiratory question box: 10 questions to ask. Standard questions box: 14 questions to ask. Wrap up box: Sentences for 8 points to explain. Most of the patients’ answers will be “NO”. How long then, will it take you to ask all these questions and wrap up the case? FIVE minutes! And you have COVERED all the guidelines and checklists. We created similar flowcharts for the physical examination, counselling, and ER stations that, with practice, will take you just 5 minutes to perform. 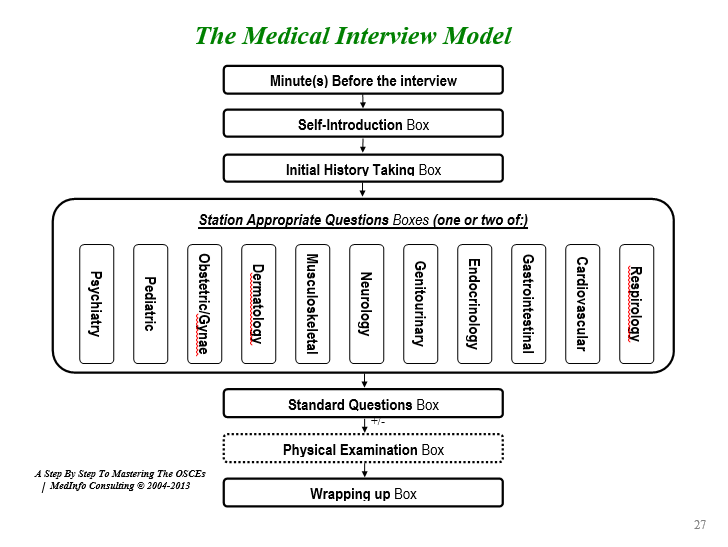 ONE flow chart of 7 steps with 23 history taking and 24 physical examinations boxes to choose one depending on the case ! Rest assured that all the guidelines are fulfilled, including communication skills. You won’t forget anything to ask, examine, or explain. No need to be anxious and nervous. You will be on a relaxed autopilot mode! Letting you focus on the clinical decision process and communication skills. The systematic approach took three of us a full year to finalize and nine years so far to tweak. Don’t you agree, it is worth a try? It is yours in just few minutes for the cost of a cup of coffee a day for a month!